Who is this bald guy from Game of Thrones? Is Thoros of Myr dead? Will Daenerys and Jon Snow get together? Did I spell Daenerys right? Everybody’s thinking it, so don’t be afraid to ask the obvious questions. 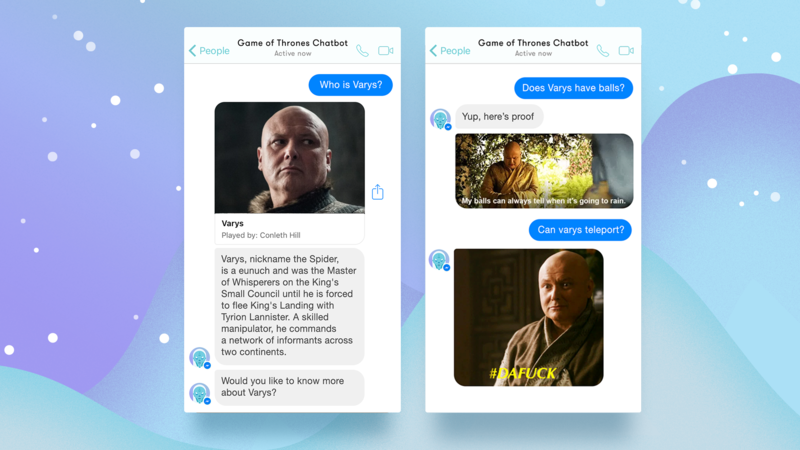 Meet GoTBot, a friendly Facebook chatbot with answers to all of your Game of Thrones questions. GoTBot is a Facebook Messenger chatbot created in solidarity with all the secondary characters you forgot about, plus all the titles and heirs that you never knew existed. It’s for those of you who realise that, in fact, you know nothing. 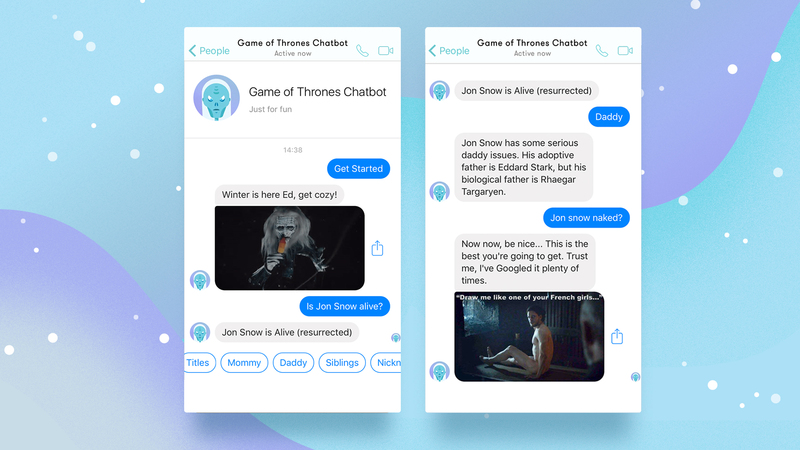 While we set out to create a genuinely useful Chatbot experience for Game of Thrones fans, we created GoTBot to capitalise on the perfect storm of chatbots reaching peak popularity, and the imminent release of the hotly anticipated Game of Thrones, combining the two to enable us as an agency to promote our services in the field of product design, featuring AI and chatbots. Even before building GoTBot, we wanted to make sure the data we are using will be relevant to the target audience. Through analysing the top Google searches for Game of Thrones questions for actors, characters and general plot questions, we built a database of starting points. By having a solid structure supported by data, we ensured that GoTBot will be useful for Game of Thrones fans. Another important action we took before launching was making sure that when AI fails (which happens quite a lot - AI is still quite young), GoTBot will have a hilarious response at hand to keep the audience engaged even when the answer is unknown. 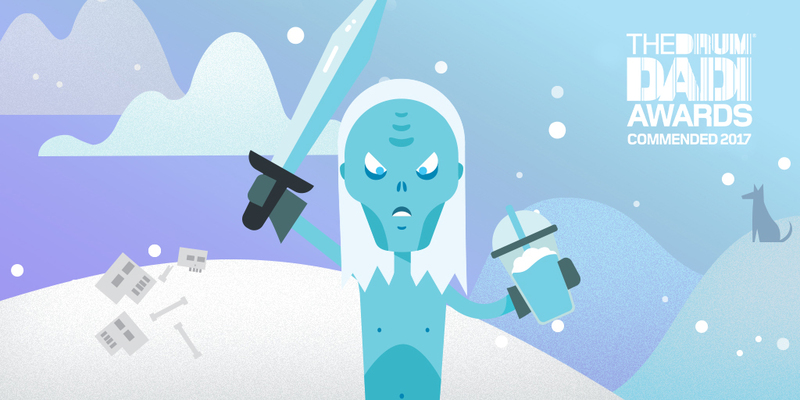 To keep users engaged, we updated GoTBot after each Game of Thrones episode that aired, adding new easter eggs and character information as the plot evolved in the show. The A.I. of natural language processing is handled by the Wit.ai service. We begin by teaching Wit.ai example questions and, as we feed it information, it learns understand the users’ intent. When the user asks a question, Wit.ai recognises the intent of what he is searching for, then our vast GoT database gets to work and answers in an intelligent and useful manner as possible, with a bit of humour thrown in to keep it interesting. At its core GoTBot uses a node.js and MongoDB server. We're also using the Google Cloud for spell checking and analytics. These analytics help us improve the bot, e.g. the more questions users ask, the more data we can capture and ensure that we update GoTBot so that it can answer these queries. In terms of marketing, we had to bring GoTBot to life. GoTBot has a strong personality and there is no better place to show that than on social - so we created a Twitter account for GoTBot, as well as a Facebook one. We had a nice conversation with fake Jon Snow of Twitteros and even tweeted a few things at Maisie Williams and Sophie Turner. We included tailored messages in GoTBot just so that we could start a conversation with, let’s say, George R R Martin. Just ask GoTBot if George R R Martin has a heart…. GoTBot made the homepage of Mashable, and was picked up by The Verge, CNet and even Esquire magazine. In the first 2 weeks of launch, GoTBot had over 20,000 conversations with 15,000 Game of Thrones fans from all over the world. The longest conversation had 826 messages between GoTBot and an avid Game of Thrones fan - a new best friend, we could say. With an impressive average conversation of 04:59, GoTBot has seen over 600K messages since launch, growing every day. At The Drum's DADI Awards we picked up Highly Commended for "Viral Campaign" and "In-House Campaign". We're also nominated in two categories at the Social Buzz Awards for "Best Chatbot" and "Low Budget" (yep, we did this on a shoestring! ), and we're exicted for awards night on Nov 29.